I went out for a quick ride Friday evening since I had weekend plans and wouldn’t be able to ride. Near the end of my ride I popped into McDowell Grove in Naperville. I hadn’t been there since the park district had completely re-landscaped it. I didn’t have much time to explore since the park was about to close, but what I was able to see looked really nice! I checked both ends. No troll. 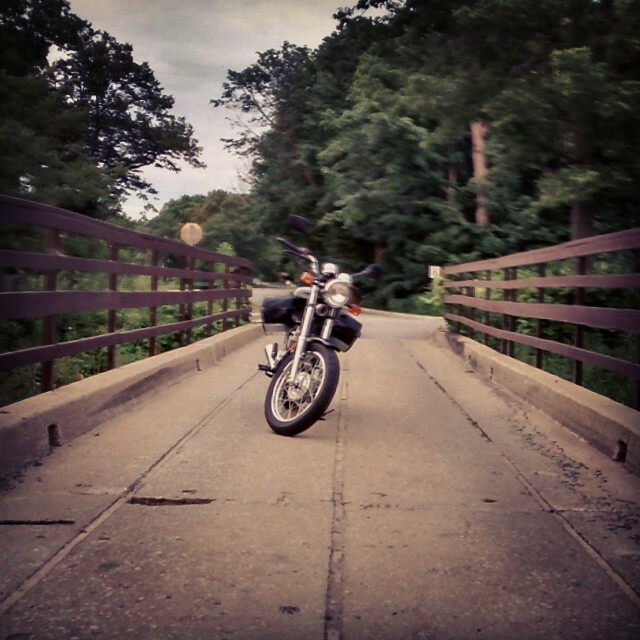 When you pull into the park, you cross the DuPage River on this bridge. (The bridge could use a little repair.) Unfortunately, my photos didn’t turn out very well since it was getting dark, so these shots don’t really capture how nice the area really is. 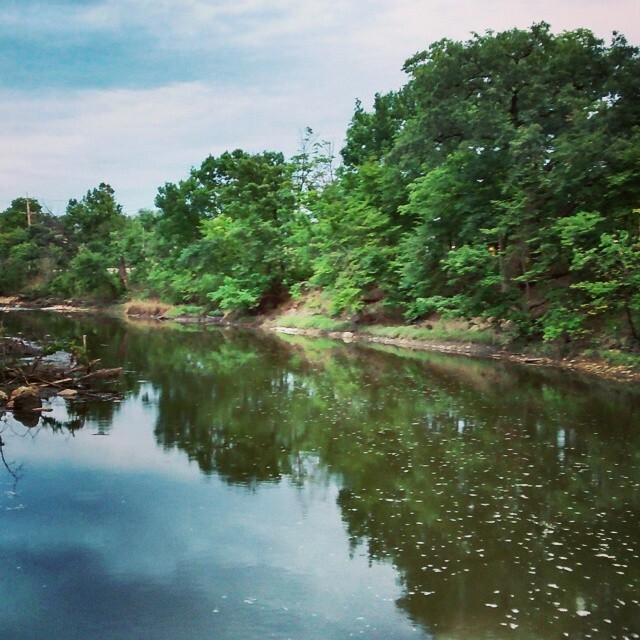 The park also provides a great view of the DuPage River and its summer foliage. I was so disappointed when I got home to see that my photos were so muddled. My phone doesn’t have the best camera to begin with, and in those low light conditions it just couldn’t cut the mustard. 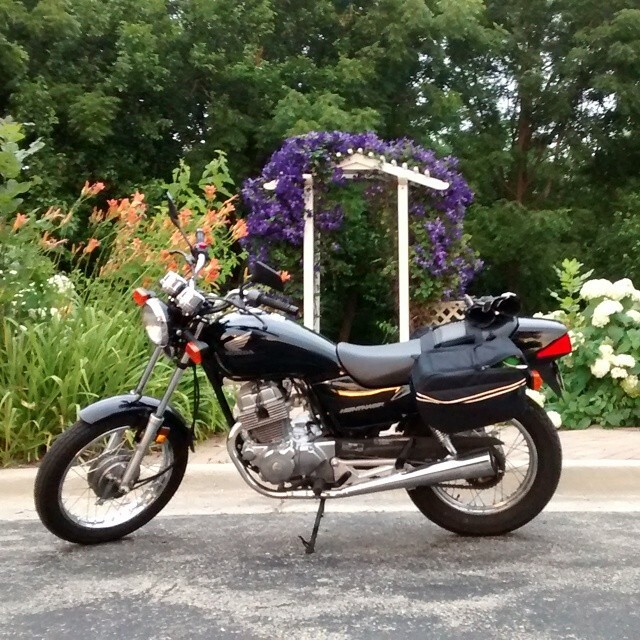 I have a Canon Rebel which I love and which takes amazing photos, but it’s large and impractical to take with me on the bike. My phone is really convenient because I can just slip it in my jacket pocket. I don’t want to miss out on photo opportunities that I might never have again because of a bad camera, so I decided it was worth it to buy a new one. I poured over camera reviews all day today and finally settled on a Nikon Coolpix L27. It’s not the most current model (L30 is the newest), but it should be good enough for what I need. I was going to go with a used L30 off eBay, but then I saw that Walmart was offering the L27 new for about the same price. Since it’s new it will have a full one-year warranty unlike a used camera, and if I end up really hating it I can always return it. Hopefully, I will be happy with it though, and will be taking some great photos with it soon!